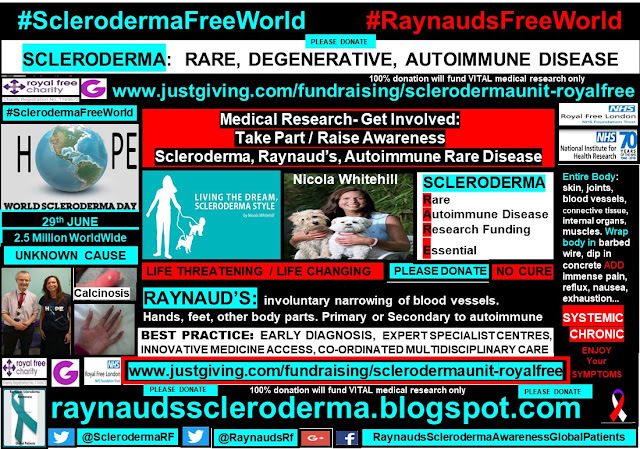 Raynauds Scleroderma Global Patients: Medical Research. Get involved: Take Part, Raise Awareness. 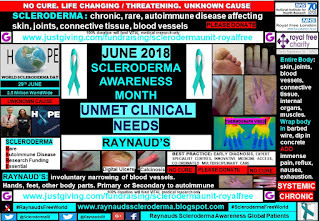 Raynaud's, Scleroderma, Autoimmune Rare Disease. Medical Research. Get involved: Take Part, Raise Awareness. 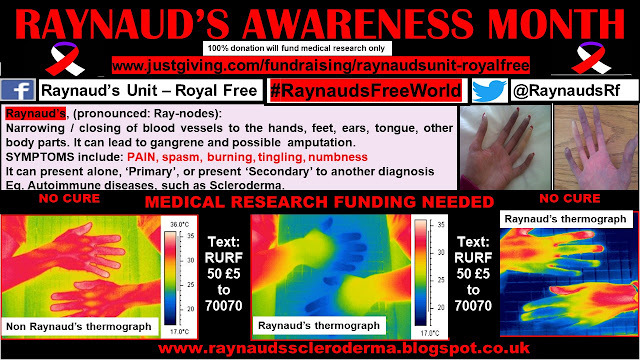 Raynaud's, Scleroderma, Autoimmune Rare Disease. Scleroderma, Raynaud's, Autoimmune Rare Disease. 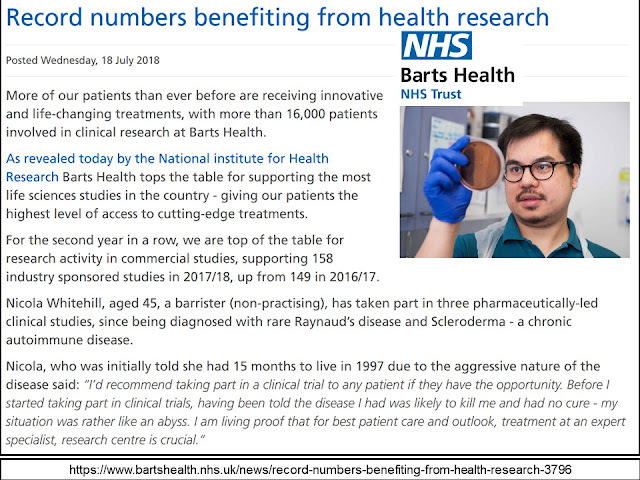 At the start of this year, I was delighted to have been invited to join the National Institute for Health Research (NIHR) as a Patient Research Ambassador (PRA) for the dermatology and musculo-skeletal departments, The Royal Free Hospital, London. This role is a huge honour for me, and one which I am VERY passionate about. VIDEO. As well as, I am very passionate about my NHS England CRG role, and European Medicines Agency role. As, all of these roles are influencers in the medical research landscape. 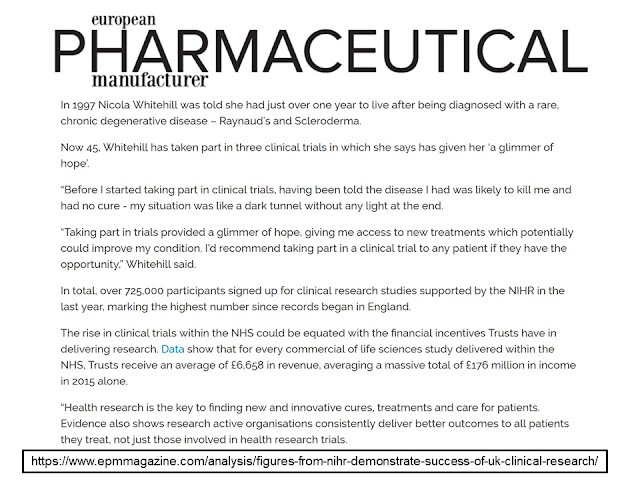 Ranging from the design of a clinical trial (my EMA role), to best practice and guidelines (NHS England role). 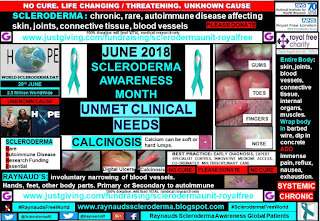 Further to my recent, local ‘Page 3 Girl’ debut in my local newspaper, (published last month, during June, Scleroderma Awareness Month), I am truly honoured and humbled to have been quoted on the front page, as well as, featured within, the recently published NIHR annual report. 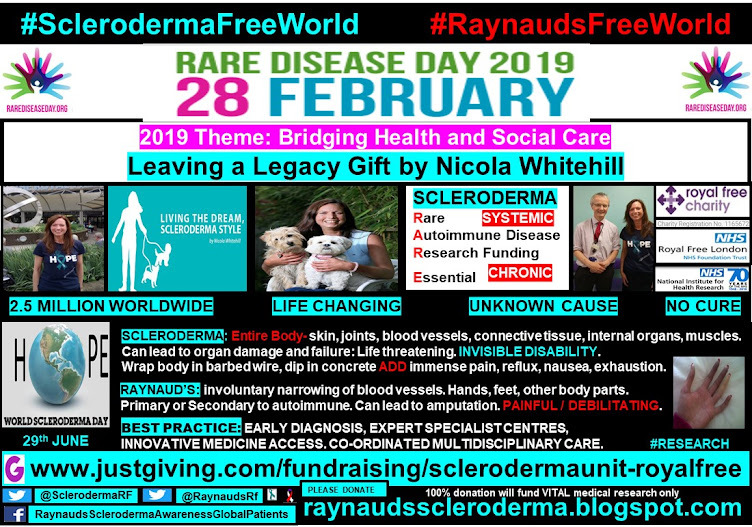 Thus, putting the spotlight on Raynaud’s and scleroderma, and the huge significance of medical research within the rare disease community. 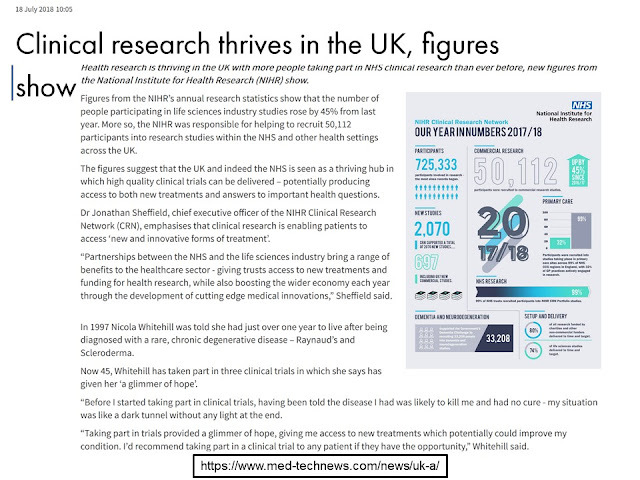 I was overjoyed that the NIHR annual report was shared by various global media. Including Med-Tech and The European Pharmaceutical Manufacturer quoting me, and naming Raynaud’s and scleroderma, in their headline story. As rare disease patients we know all too well that, any and every day, is an opportunity to engage conversation about our reality. Over here in the UK, we are truly blessed to have a world class healthcare service by way of the NHS, paralleled with the NIHR. 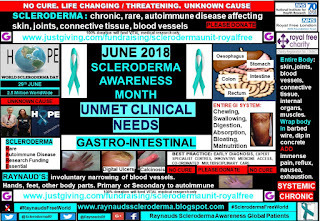 Medical research is the crux to uncovering the cause and cure to not just scleroderma and Raynaud’s, but to any disease. 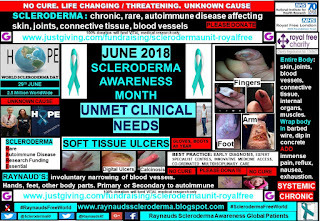 This is why, I have made medical research the underlying theme for all of the articles, which I have written for my column with Scleroderma News, and my personal blog: blog.raynaudsscleroderma.co.uk, during the course of the last few years. Also, medical research has been the theme for Rare Disease Day 2018, and 2017. 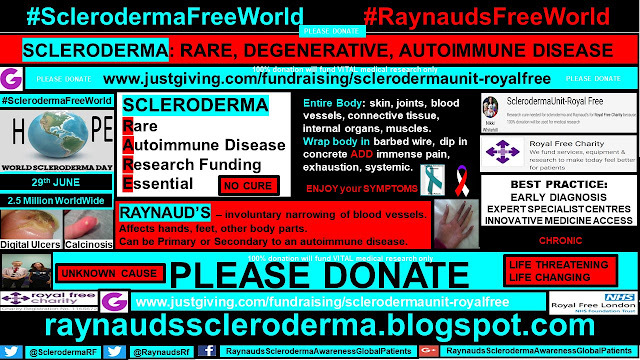 During my 21 years of living with diffuse scleroderma and Raynaud’s, I have taken part in several clinical trials. 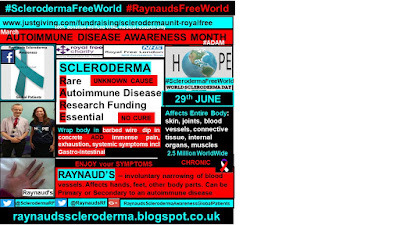 All of these trials were led by Prof Chris Denton, at the Scleroderma Unit, at The Royal Free Hospital. It was very important for me to know that the trials were being led by such an expert team. I am not the most willing of participants of taking any drug, licensed or non licensed, at the best of times. 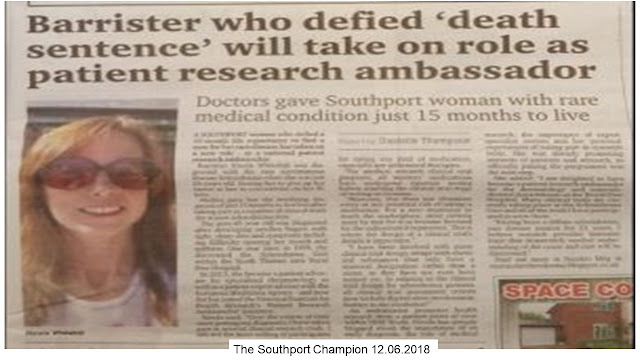 However, I saw my participation as an opportunity to investigate if there was a mystery compound which could improve my day to day reality with my symptoms. And, if I could not benefit directly, that, patients who may be diagnosed in the future, may benefit from the therapy, if the results proved favourable for such. Sadly, one of the difficulties of researching a rare disease is the lack of patient numbers available, who are eligible to take part. This is why global collaboration, as well as, global data bases and expert specialist centers, are paramount to make progress in the medical research arena for the rare disease community. 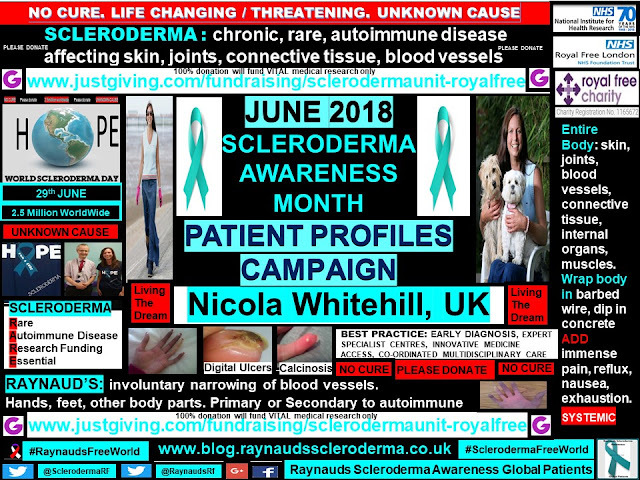 I have detailed more about my patient experience and journey, on Day 12 of my global patient profiles campaign, for Scleroderma Awareness Month 2018. 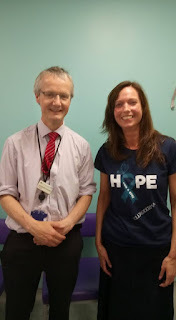 I am extremely grateful to all of the patients who have kindly shared their experience for awareness purposes, as well as, I owe huge thanks to the families of the patients whom, sadly, have died from the disease. 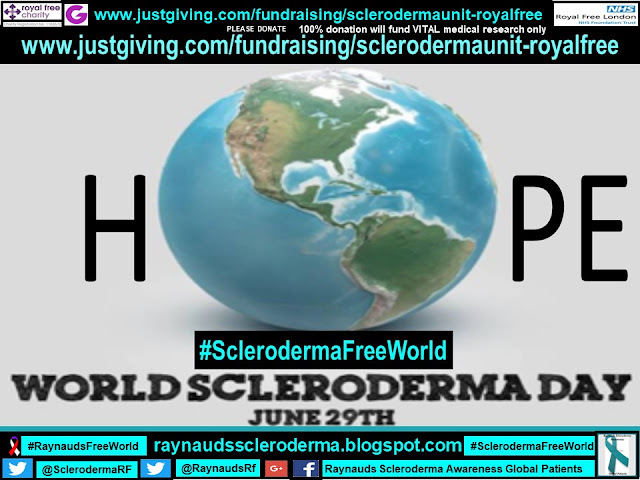 Where, investment in medical research is crucial, to improve the day to day reality, as well as, the long term outlook for the entire global scleroderma community. Although these unmet needs are not immediately life threatening, they cause havoc with the day to day quality of each patient’s life. An investment in medical research will most certainly improve the currently ‘soul destroying’ reality, these unmet clinical needs bring. 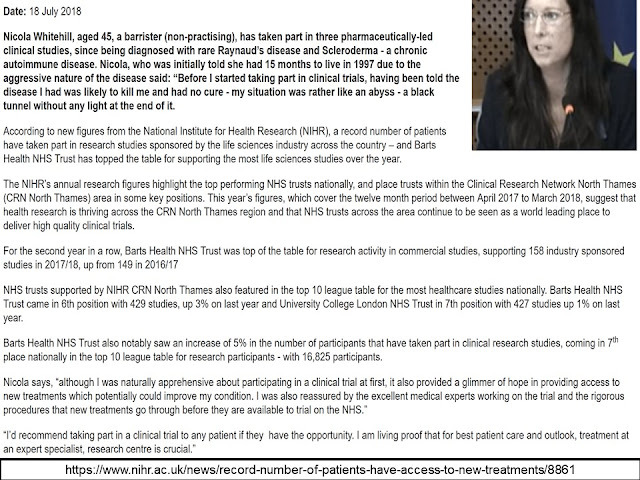 In 2015, I was honoured to become a patient voice on the NHS England advisory group for Specialised Rheumatology. In this role, I am totally blown away by the commitment and dedication shown by the medics involved, to improving the service which the NHS has to offer in this medical speciality. I feel particularly honoured to have been a patient voice, on the NHS England policy for the management of digital ulcers, published July 2015. 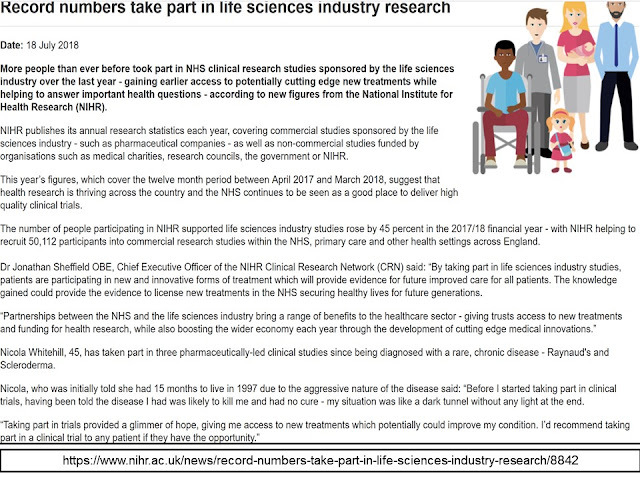 I am also very honoured to have become a Patient Research Ambassador for the National Institute of Health Research, the research side to the NHS. Video. 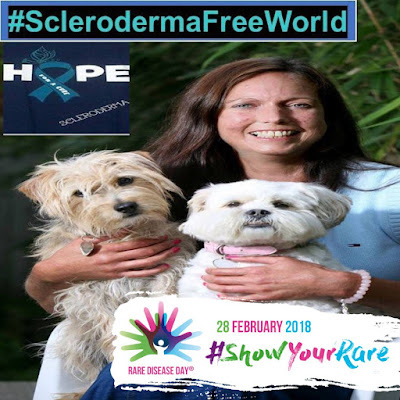 Due to the systemic involvement of my diffuse scleroderma, I am known to many of the different medical specialities included within the NHS umbrella. For optimum best practice and care, a medical ‘dream team’ is paramount, with an expert specialist as the clinical lead. 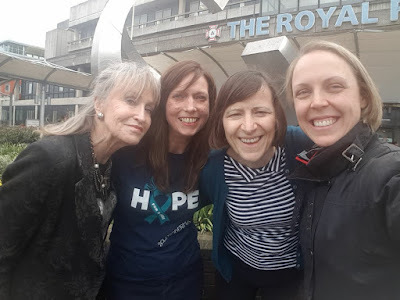 I am truly grateful for my medical ‘dream team’, made possible and available to me, by the world class leading healthcare system, the NHS. I very much recommend for any patient to take part in a clinical trial run by a center of excellence. 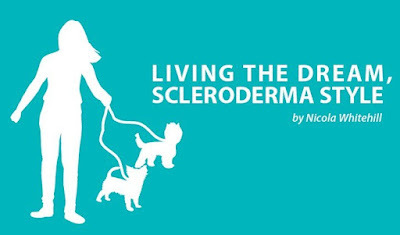 Living the dream, scleroderma style. 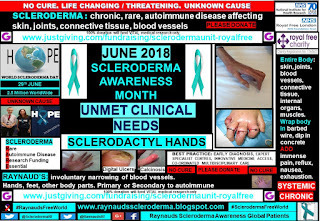 Please DONATE to help fund medical research at The Scleroderma Unit, The Royal Free Hospital, London. 100% of your monies will be used for medical research purposes only. No wages or admin costs. Thank You. 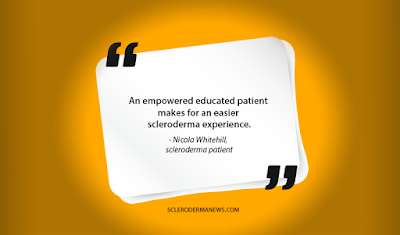 An edited version of this article, Click here, was published in my Column with Scleroderma News. August 2018. 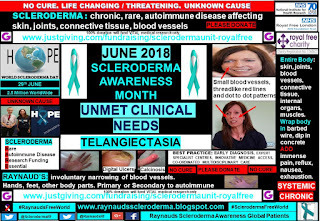 This year, 2018, I am celebrating 20 years of being a patient at the Scleroderma Unit, The Royal Free Hospital - a world leading expert specialist, research centre. 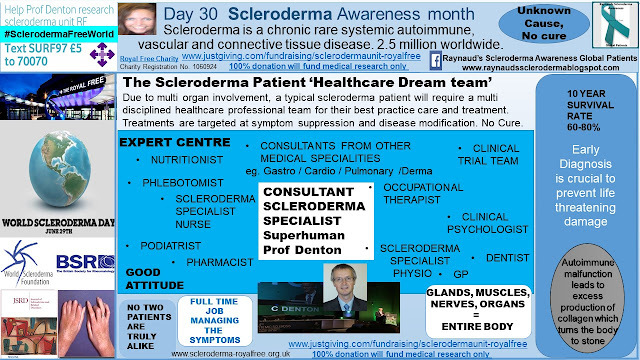 I am eternally grateful to the global scleroderma trail blazers Dame Prof Black and Prof Chris Denton, whose commitment and dedication to unlocking the scleroderma enigma, is nothing other than, superhuman. I am truly humbled and inspired by their work ethic. I am wholly appreciative for Prof Denton’s continued medical expertise and support, especially during my barrister qualifying years, 1997 - 2004. 1st March 2004, I qualified as a self employed practising barrister. Further to having been told in 1997, by my diagnosing doctor, that I was looking at a 15month prognosis. 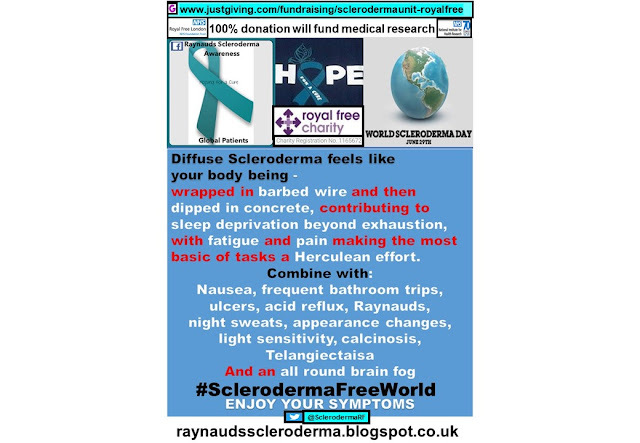 World Scleroderma Day 2015, 29th June. 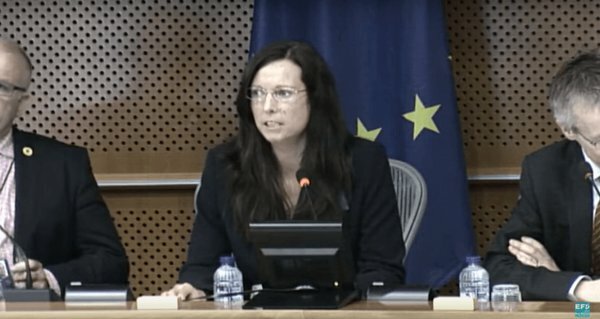 I had the pleasure of being a presenter and part of the European co-hort who gave a presentation at the European Parliament, Brussels, in honour of World Scleroderma Day 2015. I am immensely grateful to James Carver MEP for organizing this event in memory of his late wife Carmen, who sadly passed from Scleroderma.